HOMELESS FAMILIES LIVING in hotels are being told to vacate the rooms as demand for rooms in the run up to St Patrick’s day increases, it has been claimed. Sinn Féin TD Sean Crowe said his constituency office has been receiving calls from worried families who are saying they will have nowhere to go if they are thrown out. The Dublin Regional Homeless Executive released figures this week that show 60% of homeless families in the Dublin area have been in emergency accommodation for more than six months, while 40% of families have been in hotels, B&Bs, or hostels for over one year. There are 138 families have spent more than 18 months in emergency accommodation. 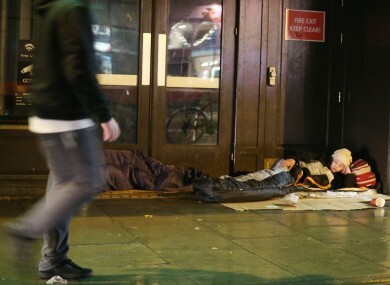 Crowe said that the numbers of homeless on the streets are sure to shock overseas visitors. “Families have been in contact with my constituency office saying that they are being told to vacate their rooms in the run up to the St Patrick’s weekend and have literally nowhere to go. “Homeless families are facing into St Patrick’s weekend with nowhere to stay or go for that weekend. There is no emergency plan, no emergency measures, and no solutions coming from the Government as they head off to other parts of the globe. Email “TD claims hotels are asking families to leave as Patrick's Day demand surges”. Feedback on “TD claims hotels are asking families to leave as Patrick's Day demand surges”.